Dramatically perched on a bluff overlooking the azure Indian Ocean, The Ritz-Carlton, Bali Resort & Spa embraces the mystique of Bali, its bewitching natural beauty, and the inherent grace and hospitality of its people. With 375 guest rooms, suites and villas; eight restaurants and lounges to appease a variety of palates; a comprehensive spa complex, including a 650 sq. m. Aquatonic® seawater therapy pool; an 18-hole golf putting course; and a secluded private beach. The Resort invites total relaxation and self-indulgence. Thirty-eight new Cliff Villas with stunning Indian Ocean views state of the art facilities, private plunge pool and the finest amenities provide the latest in luxurious accommodations. It is only 20 minutes to the hustle bustle of Kuta Beach and its round the clock life, Bukit Peninsula with its many famous surfing sites and its spectacular ocean views, Uluwatu Temple, 25 minutes to Denpasar City. Championship golf at the 18-hole Bali Golf & Country Club (15 minutes away). The Ritz-Carlton, Bali Resort & Spa has 243 guest rooms and suites, 47 rooms and suites in The Ritz-Carlton Club Level; and 48 villas. All guest rooms and suites are decorated with Balinese-crafted furnishings with private balconies and garden or ocean views. The Club Level features a handsomely furnished lounge, five daily food and beverage presentations, and a professional concierge. Luxurious one-, two-, and three-bedroom villas offer total seclusion, panoramic Indian Ocean views, air-conditioned indoor living rooms, open-air lounge areas, plunge pool and personalized butler service. 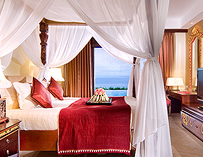 Guests of The Ritz-Carlton, Bali Resort & Spa have the services of a multi-lingual staff, on duty 24 hours daily. * Resort View Rooms: (Overlooking Tropical Garden) 54 rooms (23 Twin + 31 Double). Influenced by Balinese design with alang-alang thatched and tiled roofs, open-air or indoor seating, The Ritz-Carlton, Bali Resort & Spa's eight restaurants and lounges create atmospheres and cuisines to suit every mood. The '++' behind the Published Rates indicates that these prices are subject to an additional 11% Indonesian Government Tax and 10% Service Surcharge. Breakfast is usually not included in Published Rates. Our Internet Rates are already inclusive of 21% Tax and Service Surcharge. B'Fast "Excluded", means Breakfast is NOT included in our rates.